Peak foliage has passed. Around here it was about three weeks ago. Earlier farther north. We have had some wind, plenty of it in fact. And lately it has been raining. A lot. Wind and rain tear down the leaves, especially after they have reached their peak color. And so it has been. But there is still plenty of color to be had in the trees. This morning I went down to the lake. I was hoping to find ducks. And maybe a late shorebird. Shorebirds have mostly migrated through, but there are always a few stragglers. But I didn’t see any today. I did see ducks from up north, however. Some of them will stick around for a while, as long as the ice stays away. I saw Buffleheads and Goldeneye and even a Black Scoter. Even if I hadn’t seen any, however, it would have been worth it. Even on the Vermont side there were a few gems. One oak was ka-powing right next to my car. And there were maples lining the road in a couple of spots–yellow and red and orange. I mean, it isn’t what busloads of visitors come to see. It wasn’t whole hillsides of brilliance. But still, there is some color sticking around. By Thanskgiving it will all be gone, but I’ll take it for now. Last Sunday we had some wind. Lots of people had some wind. OK, lots of wind. Strong wind. Hurricane-force wind. It didn’t really start up until after dark. We went to bed. We slept little. Wind buffeted the house. Meaning, the house literally shook. I have not felt wind like that here before. It whistled through windows and any other crevice it could find. It blew stuff around outside. We tried to sleep, but it was just too dang loud. In the morning we saw our aluminum porch chairs scattered on the lawn. Another chair, plastic, was in the neighbor’s field. While searching for it, my wife discovered the flipped trampoline. The wind lifted that puppy up and tossed it against the garage. Imagine what would have happened if it had blown into the field. It might have rolled right into town. Unfortunately, it didn’t fare well. It’s frame is made from steel tubes. Several of those tubes are bent and ripped. Not safe. We managed to right the thing, four of us leveraging it to standing again. It looked, however, pretty sad. The thing is, it is still windy. The wind has not kept up constantly but we have had some stiff winds every day for a week. Right now, trees wave back and forth. Hang on to your hat. I have been to the lake a few times this week to look for shorebirds and waterfowl. Whitecaps. Rain has fallen frequently among all this wind. At least the convection is keeping things somewhat dry. Some of our neighbors had their power restored only yesterday. We lost ours for less than a day. That makes hygiene easier. Plus checking the weather. I baked blueberry raspberry muffins this morning. Electricity makes that possible. Eating a hot muffin and drinking hot coffee while looking out over the windblown field makes for a fine Sunday morning. The wind keeps blowing and the house still stands. On to next week. Last night the wind picked up. My daughter and I started today with a 5K run in Shelburne. There were not that many runners but it was a perfect day for a run. The temperature was mid-fifties when we started, clouds puffed their way across the morning sky, and the wind kept at it. A wind jacket was just enough with a pair of shorts and short sleeves. We were done early, home by 9:30. 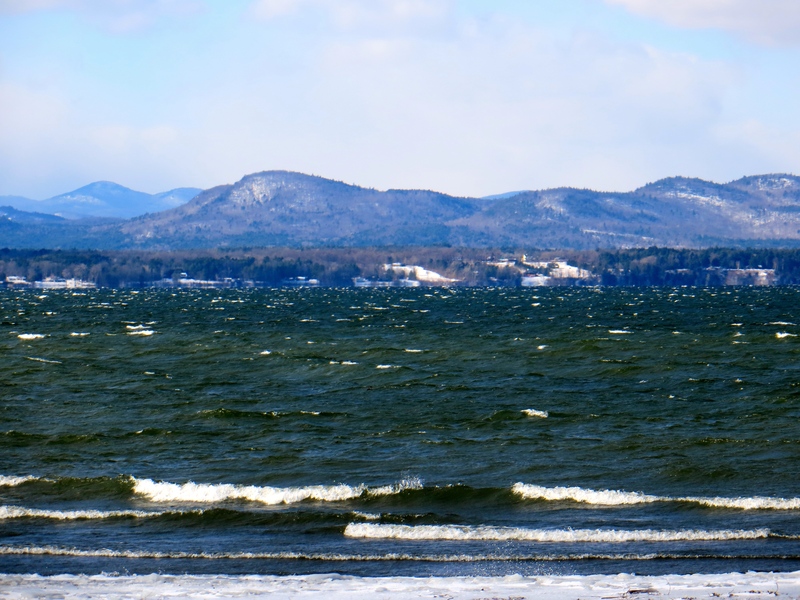 We got to see some fine views of the Green and Adirondack Mountains, as we often do here in the Champlain Valley. The trees still donned their colors, but the wind muted things a bit. The leaves are doing what they do this season–falling. So the hills are losing their luster, but still, it is hard to take in all the glory. Just before we started the run, a Northern Harrier caught the wind. It soared and dipped and cornered and curved. Its white rump flashed in the high sunlight. It flew north. Then another Harrier appeared, chased by an American Crow. The crow dove to harass the hawk, missed, then rose up to try again. The Harrier seemed to shrug it off. If birds could roll their eyes, this one might have. Later, at another spot on the lake, I watched a Red Tailed Hawk fly past, high overhead. The wind was strong enough that its wings were tucked tight. Twice I saw it spread its wings to turn a bit, then it pulled them in again and made a bee line south. It looked like it was diving while horizontal. It was a stiff wind. A moment later I watched a second Red Tail follow the same path. It was a good morning to make some distance. Late today rain started to fall. I had just washed out the birdfeeders. I pulled them apart and scrubbed them with soap in a bucket. It want them clean so I can start putting them out again. Wind tossed the branches around while I dunked my arms into soapy water. I left the parts out to dry. The wind should help make that happen quickly. The rain will hinder that. Good thing I put everything under cover of the porch. Soon the leaves will be off the trees. Winter will feel close. Already we have had frost. The other day I pulled in the basil and made a batch of pesto to freeze. I started a fire outside late yesterday and we spent a few hours in the autumn colors with the warmth of a fire. It got dark early. Again the seasons turn. Around here, they make a show of it. The high temperature today was 2 degrees. Cold. The wood stove did its work. The chickadees and tree sparrows and woodpeckers kept busy at the feeders. Snow fell early and clouds passed in and out the rest of the day. It wasn’t summer. And the wind blew. It howled. It battered the house. It buffeted the windows. It whipped the snow. Snow eddied on the porch and piled against the door. Snow gathered on the lee side of snow banks. It formed drifts in the road. The wind-chill adjusted temperature was about 25 degrees below zero. Not a day for sunbathing. The driveway drifted in. That does not often happen but this is the kind of day it would drift in. It is a long driveway, next to a meadow, so I suppose it is to be expected. The house came with snow fencing when we bought it. We have never put it up as it hasn’t been needed. Our plow guy made an extra trip today. 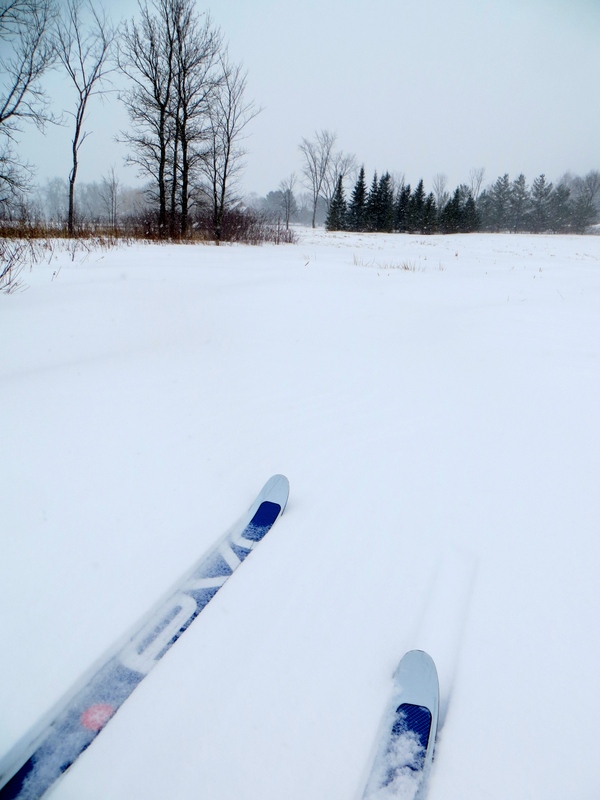 This afternoon I took a few laps around the field on my skis. The track that my son and I made yesterday afternoon was almost totally hidden in drifting snow. We had to make that track because the previous one got snowed in. So I followed the track I could find and broke a new one where the track had disappeared. Snow blasted against my jacket, although I was well covered. My eye lashes froze from my breath’s condensation. 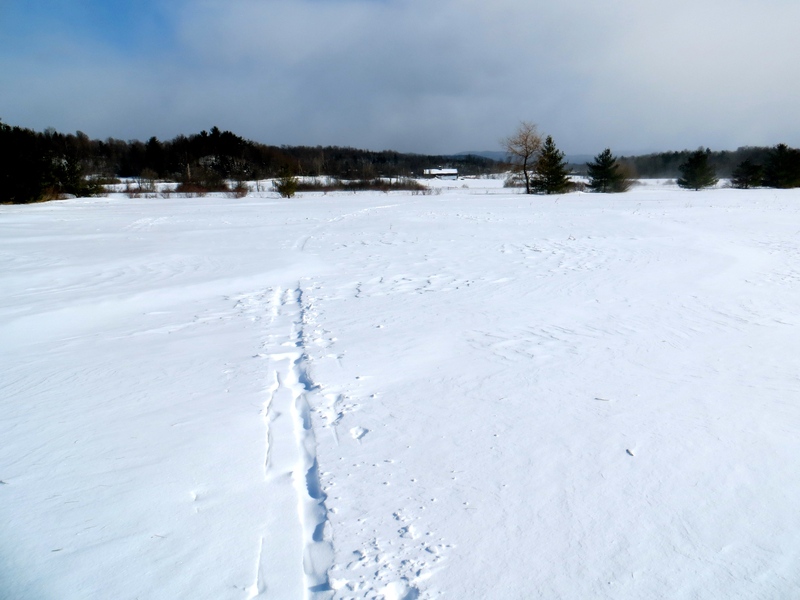 The second time I looped around, much of my track had vanished again and the rest was hard to see. This happened each time. It was not fast skiing. The day, however, was beautiful. The landscape changed by the moment. 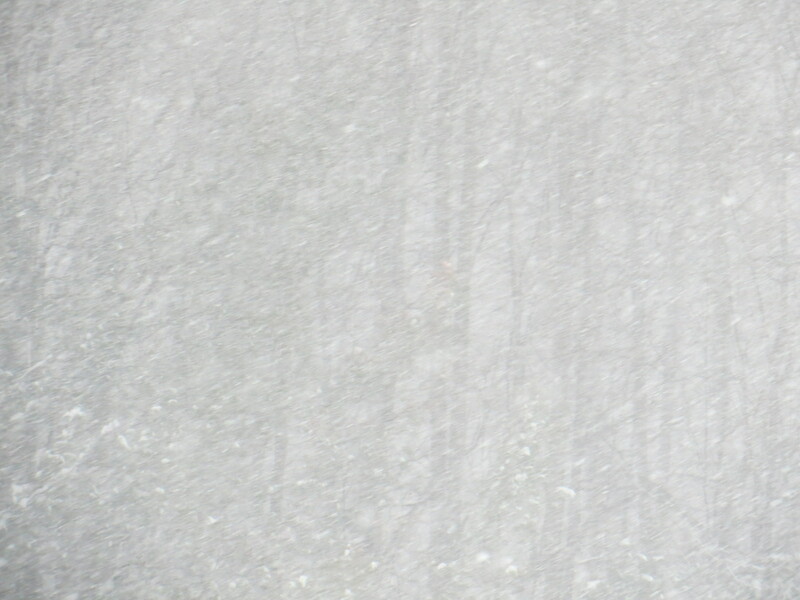 Snow swirled in misty towers and sped low across the road. The sun shone periodically and the world glowed when it did. I stayed out for while before filling the bird feeders, hauling in more firewood, and settling inside again. Tonight the low is forecast at -13. That’s exciting. It likely won’t get out of the single digits tomorrow. It has been three weeks since the temperature got above freezing. Looks like that won’t happen again for a while. Still, I’ll get outside and enjoy the snow. Meteorological spring, after all, is a mere five weeks away. I worked at home today and was remarkably productive. By 11:00 I had gotten most of the things on my to-do list completed. I can’t say that happens every time I work at home. Today, however, I managed to crank it out. Mid-day I took a break, suited up for the weather and headed to the lake. I was hoping to see ducks on the open water. The first spot I stopped was a no go–it was frozen solid as far as I could see. No ducks to be found there. So I headed south and found some water that was less solid. 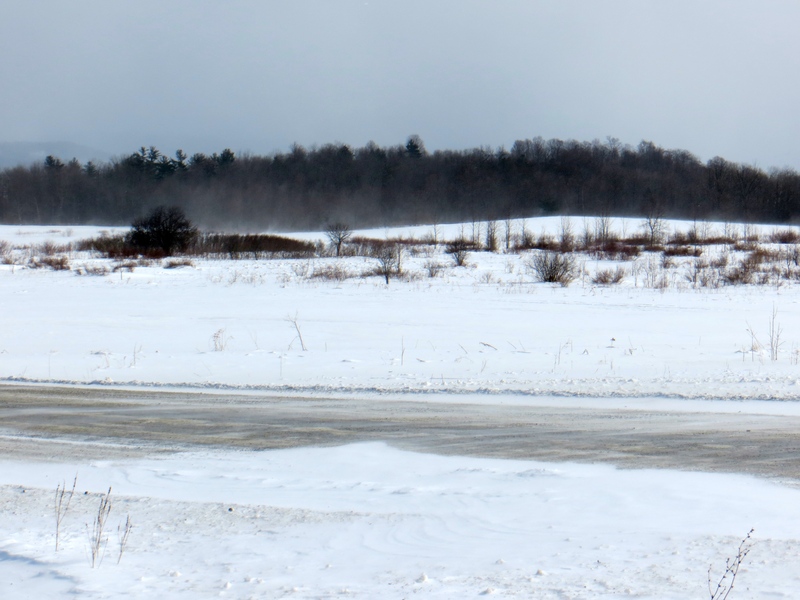 The Shelburne Town Beach can be iced in early, depending on the wind and the temperatures. If wind blows into the bay it can be iced over; if not it stays open. Today the wind was blowing right toward shore but the ice was hardly piled up. It has been cold lately so there is plenty of ice on the lake. There just wasn’t much ice right there. I did see some birds. There were scores of Mallards and several Common Goldeneye but it was hard to see them well. The wind was blowing so hard it was difficult to keep my spotting scope steady. It was even a challenge to keep binoculars steady. I had to lean into the wind to keep from blowing over. I got to see a Bald Eagle soar overhead a couple of times. It was a beautiful mature bird. Unfortunately, it scared away most of the ducks. I got cold, as you can imagine, but only partly. My hands were getting numb but the rest of me, thanks to my awesome down jacket, was toasty. I moved on to another site and saw even fewer birds. I tried to stick it out but the wind was fierce. Even the birds were having a hard time. Mallards were surfing and getting dunked under the waves curling at the shore. It was a harsh situation. I didn’t see any new birds for the year but it was pretty amazing to see the lake like that. Every time I go it looks different–blowing one day and calm the next, green sometimes, clear others, frozen water or calm water. It is never the same so is always amazing to see. My year list stands at 33, not terrible for mid-January in Vermont. I missed the Harlequin Duck when I went up to Grand Isle briefly to find that rarity, so bummer for me. I do plan to head to Florida later this month. I am sure that will prove to be a birding foray to write about. Until then, I don’t expect much. If I could get out there every day and really explore, maybe I might find all the avian treasures. But I do have to work. After I got back home today I tossed a log into the woodstove and got down to some email. I did some scheduling and printed a letter to mail and generally got some more office-type stuff done. It was a lot warmer at my desk. But not nearly as fun. It started snowing early in the day. School was cancelled. Then the snow let up. I went to work. Luckily I only was in town half the day. The drive home was slick and slow. Then it really started to snow. By late in the day it was coming down and the wind picked up. And the temperature dropped. We had ourselves a snowstorm. I went for a ski around the field. It was fine when I had my back to the wind but heading into the wind–ouch! Those little crystals of ice are painful when they slam into one’s face. My hood was a handy tool. By my second lap my ski tracks were almost filled in. This morning the snow was still falling. Drifts piled against the house. I could only see out half the bedroom window. No school today. I will get some work done from home. First, however, I plan to rekindle the fire in the stove and to brew some coffee. And to appreciate being warm inside.